This saturday: JT Eberhard of the Missouri State University chapter of the Church of the FSM has arranged for biologist PZ Myers and author Richard Carrier to speak at MSU. Please come if you can! We’d like a huge turnout. PZ Myers and Richard Carrier to speak at Missouri State University. Oct. 11th at 1:00pm in the PSU Theater on the Missouri State campus. 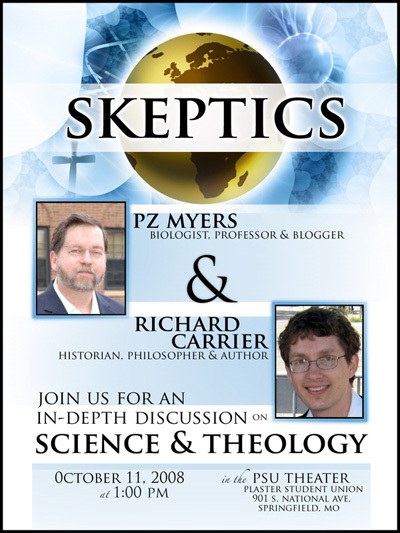 Biologist PZ Myers and author Richard Carrier will speak about how their related fields apply to Christianity and faith in general. Paul Zachary “PZ” Myers is a Biology professor at the University of Minnesota Morris and the author of the science blog Pharyngula. He is currently an associate professor of biology at UMM, works with zebrafish in the field of evolutionary developmental biology (evo-devo), and also cultivates an interest in cephalopods. He is a public critic of intelligent design and of the creationist movement in general, and is an activist in the American creation-evolution controversy. Richard Carrier is a published Historian and philosopher. He is the author of “Sense and Goodness Without God,” though he is best known for his writings on Internet Infidels (otherwise known as the Secular Web), where he served as Editor-in-Chief for several years. He is a noted advocate of metaphysical naturalism. He has published many articles in books, journals, and magazines, and also features on the documentary film “The God Who Wasn’t There” where he is interviewed about his doubts on the historicity of Jesus. Besides his work in print, as a contributor to the Secular Web (one of the main web sites for skeptics on the internet) Richard Carrier has composed research articles on subjects ranging from the origins of Christianity to elements of naturalist and atheist philosophy. He has also engaged in several formal debates, both online and in public, defending subjects as diverse as naturalism as a worldview and natural explanations of early Christian resurrection accounts. « OMG! You people have gone mad!